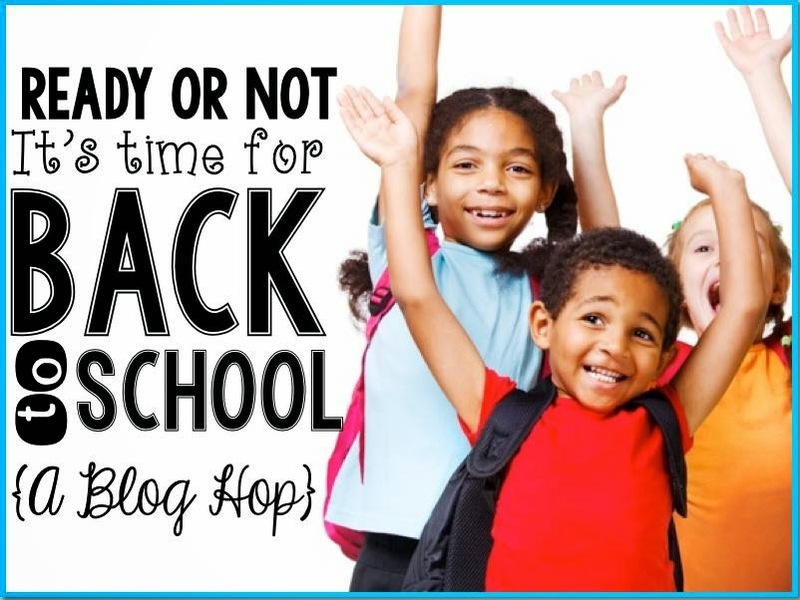 I am joining some of my blogging buddies in a Back to School Blog Hop! Here's a great tip on Whole Brain Teaching, to help you breeze through back to school preparation! I love Whole Brain Teaching and each year, I introduce more and more of their strategies to my students. If you aren't too familiar with Whole Brain Teaching, I urge you to check out their website and see what all the hoopla is about. This year, I plan on utilizing the Super Improvers Wall. The purpose of the Super Improvers Wall is so that the children can play an important role in goal setting, so they are self motivated and fully committed to reaching for their goals every single day. The more effort they put into it, the higher they will get on the Super Improvers Wall. The way it works is, about once a day, if you see your students working hard to reach their individualized goal(s), they earn a star sticker on their labeled, colored star. The color of the star matches the level they are on. Once they earn 10 star stickers, they move up a level and you give them a new star that matches the color of that level. It should take almost all year for the children to get to the top of the chart. Since I don't have my display up yet, I made this pretend display. You can see that my very small, imaginary class of 6 children, have their name on a star that matches the level they are on. For example, Al is a beginner and Kim is an MVP. I will put a foil star on their colored star each day that they put forth the effort it takes to strive to reach their goal(s). As mentioned earlier, once they earn 10 star stickers, they advance to the next level. You may be thinking that you have some students who are already perfect and it will be hard for them to come up with goals. Well, the bottom line is, no one is perfect, and there is always something they can improve upon. Let me give you a good example of how no one is perfect! At first glance, he seems perfect. Cute and cuddly, right? Well, look again! 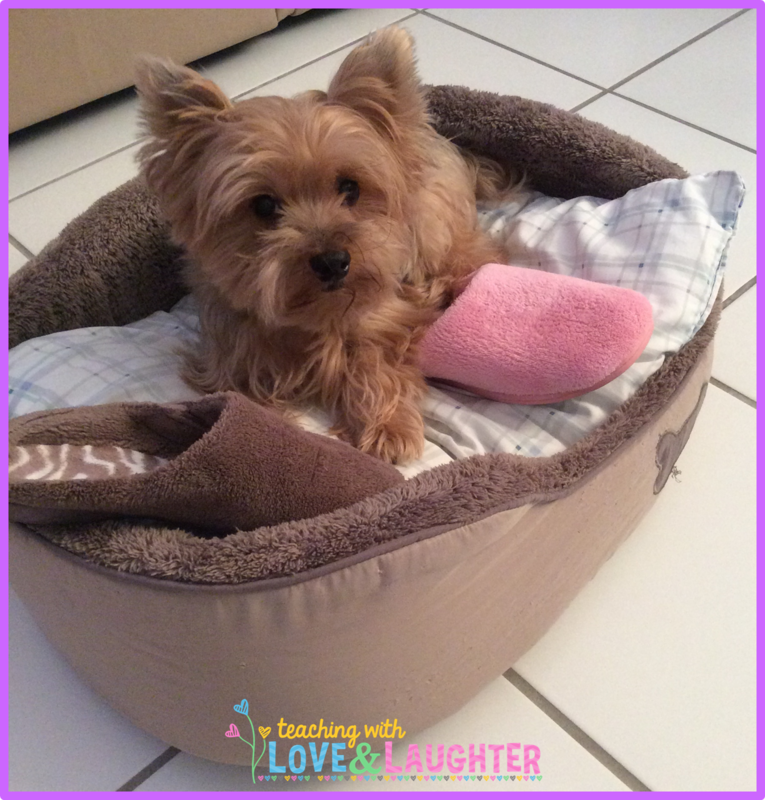 See that fuzzy pink slipper? That is not Buddy's toy. 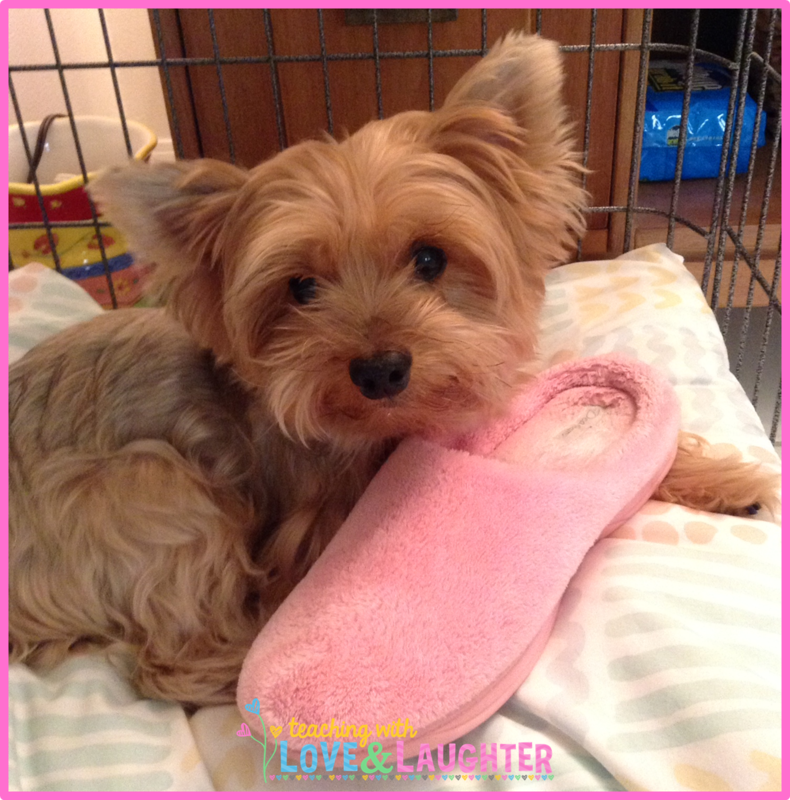 That is my slipper! Buddy is not perfect after all. He has an affinity for stealing slippers. He doesn't chew them or ruin them. He just stalks people and when he sees they took off a slipper, he waits until no one is looking and swipes it. He brings it to his bed or crate and either hides it under the pillows or just goes to sleep with it. At times, he has 2, 3, or even more slippers in his bed. And it's hard to get mad at him when you see that sweet face! But, the bottom line is, although he doesn't ruin the slippers, it's wrong to steal them. He needs to put forth some effort and try hard to curb his appetite for slippers. So, that is his goal. "I will not steal slippers." Each day that I see him ignore a slipper, I will give him lots of praise, belly rubs, and a star! Now look at Buddy! 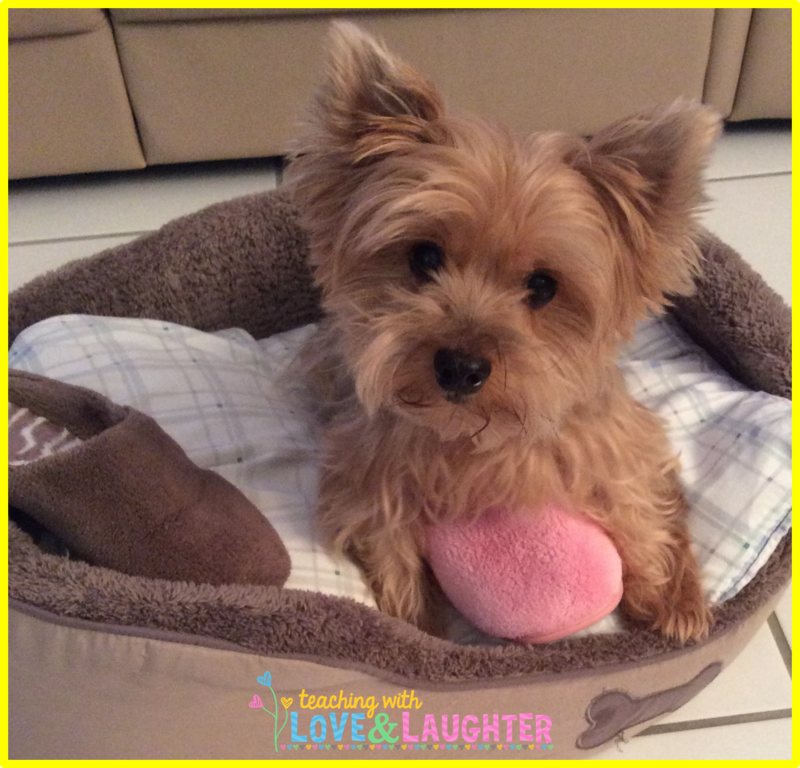 After earning some stars, he is able to sit next to a slipper without the urge to steal it. The Super Improvers Wall is doing it's job! 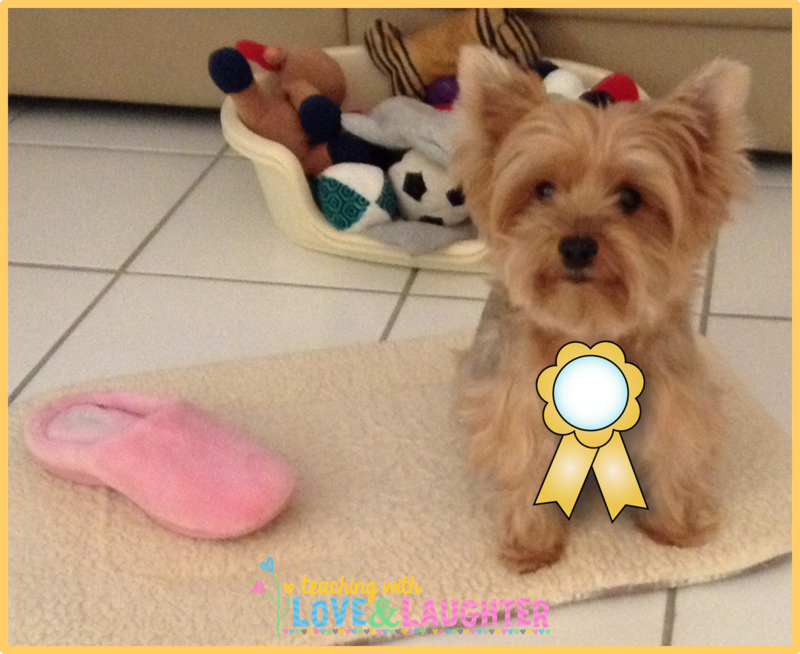 Buddy is motivated to get to the next level so he can get a new star a treat! I am super proud of Buddy! His slipper stealing days are (almost) long gone! But, even better, he is SUPER proud of himself for reaching his goal. Just look at that winning smile! You can read more about how to utilize the Super Improvers Wall here. If you download my Super Improvers Wall, you can read more about how I plan on using it. I'm sure there are many different ways you can use it successfully in your classroom. 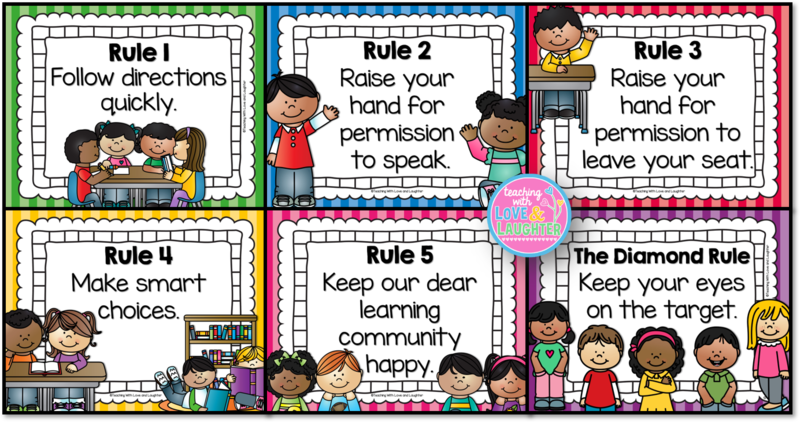 Included in the download of the Super Improvers Wall, are these posters of the 5 Whole Brain Teaching Classroom Rules. I also made printable student books so the children can share the rules with their family! 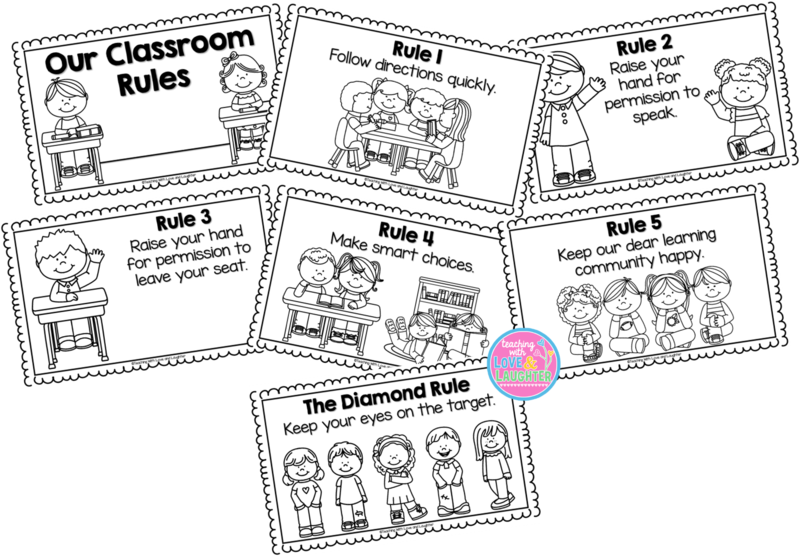 *I included a set of posters and booklets without rule 3, as I do not use that rule in my classroom. Click here to read all about how to teach these rules to the children using gestures. 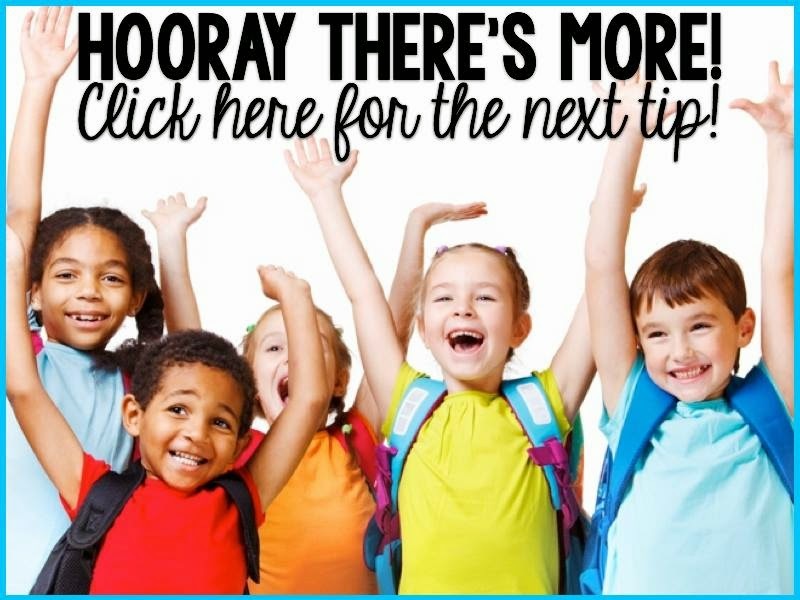 I hope you enjoyed my back to school tip! Click the image below to hop to the next blog! Nicole has an awesome organizing tip for you! You're so sweet Wendy! Thanks for always having a kind word for everyone! I'd LOVE to be a student in YOUR class! Ha! I knew you'd appreciate the Buddy pictures! 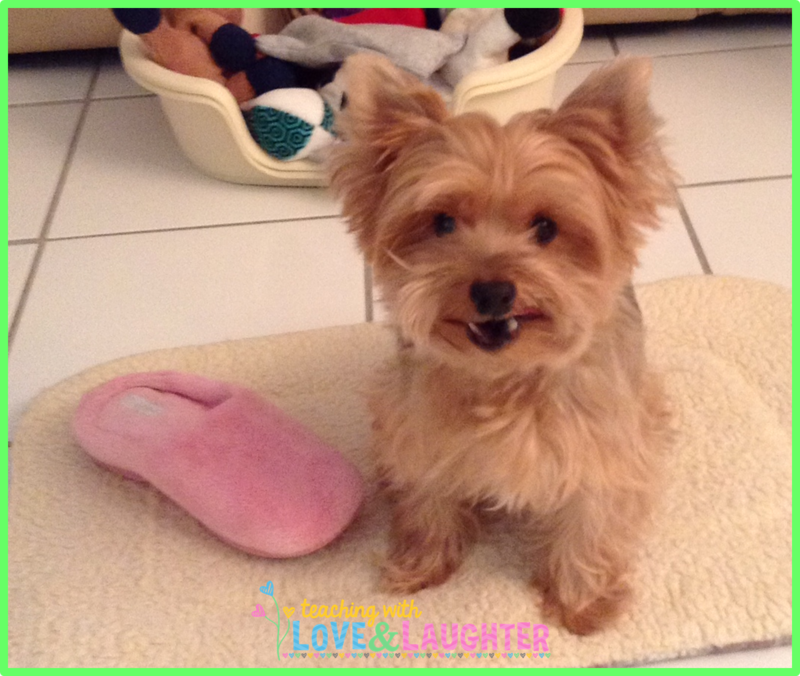 Now that he's not stealing slippers anymore, he is fit for a play date! LOL! Thanks so much Chris! Buddy is a yorkie. I have two of them! I've had an interest in WBT but never knew a good resource to start at. Thanks for sharing, it looks wonderful! Buddy is adorable! My dog loves taking my socks and flip flops. Luckily, she doesn't chew them. 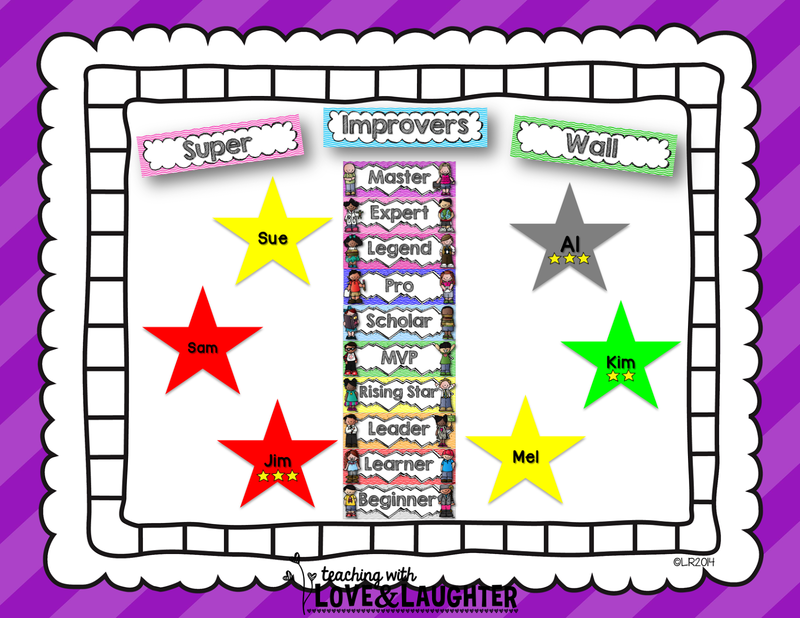 Try the Super Improvers Wall! LOL! I love the Super Improvers Wall! Once you get going it gets easier and easier to maintain! OMG Buddy!!! ahahahah!!! Love it!!!! He's so cute, right? How can I possibly get mad at him? Your dog is adorable! I have been using the Super Improver Wall for the past 2 years, and I love it. Yours looks awesome! Buddy is too stinkin' cute! I was hoping others would agree he is as cute as t think he is! LOL! OMG your dog is SOOOO cute! Thank you! He is pure love! Oh my gosh, Buddy is tooooo cute! I love the little smile at the end! Thank you so much! I just adore him! 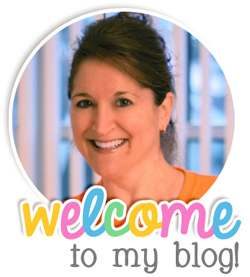 I fell in love with WBT last year and am also excited to add more of it to my teaching! Thank you for sharing and I'm looking forward to reading more! Buddy is absolutely precious!!! Thank you so much Stacia! Your dog is the cutest thing ever!!!! I have been riding the fence about WBT. There is soooo much to do with it and I'm scared I won't keep it up. I saw this done before, but your description made complete sense. I love how you explained everything. Thank you!!! Thanks so much Keri! As far as there be a lot to do, just do what I did. Introduce the fun stuff slowly. It was really easy and made all the difference! Thanks so much for sharing these colorful posters! They'll be perfect in my room. I am looking forward to trying a Super Improvers Wall. I just love your little Buddy. It's probably hard to stay mad at such a little cutie! That smile just cracks me up! Thanks Jeannine! I am so glad lots of teachers will be using the SIW! Yes! It is almost impossible to get mad at Buddy. He just has to look at me and I melt! 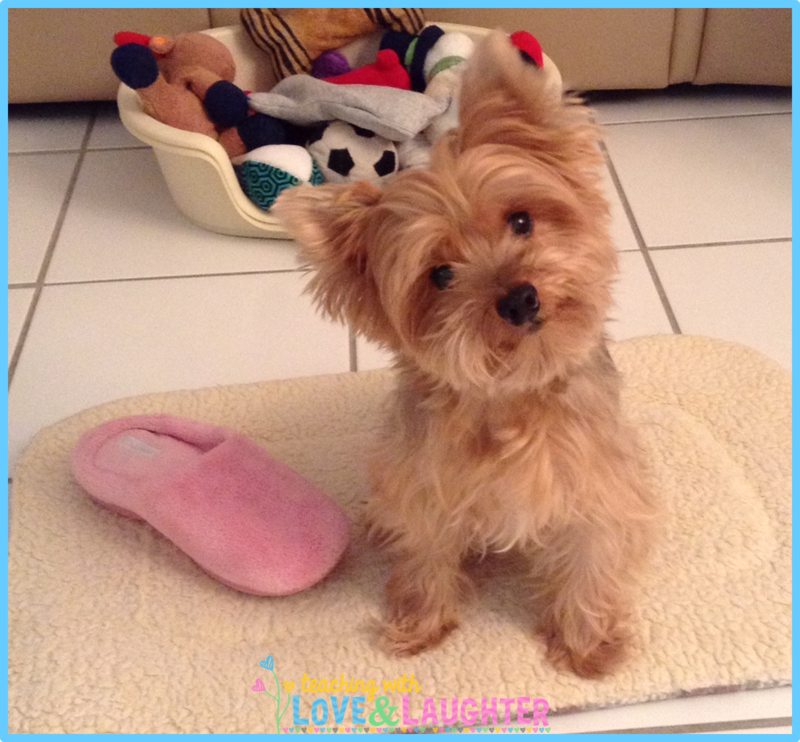 I have a overwhelming urge to mail a box of slippers to Buddy!! LOL! He would love that! Best post, Best doggie ever! Awww! Thank you Fern! Love the cute pics of your sweeties too! I used Super Improvers this last year and I LOVE it. I didn't have students make their own goals, but I think that is a fabulous idea...definitely plan on doing that this year! I can't wait to start it! I love everything about it! So glad you like it! Thanks very much for the kind words! So glad you enjoyed my post! I am really looking forward to seeing this in action in my classroom! Hi Lori! I'm so excited you posted about this!!! I love using WBT with my KinderKids! They really respond well to it. Your post is so helpful and inspiring! Thanks for another great topic. BTW... Buddy is adorable!!! Thank so much Hilary! I just added a printable student book to the free download! LOL! Great post! I’m learning about WBT to begin implementing in my class this year. Thanks for sharing! LOL! Thanks so much! I know you love your little furbaby too! I am awed to be in your presence!! Poor little Buddy. Just go buy him a pair of slippers!!! Buddy is adorable! You need to write children's books about Buddy. He is such a great model the way he sits up and look at the camera. What a ham! As always, another great idea, Lori! I love the Buddy pics! He is such a good role model!